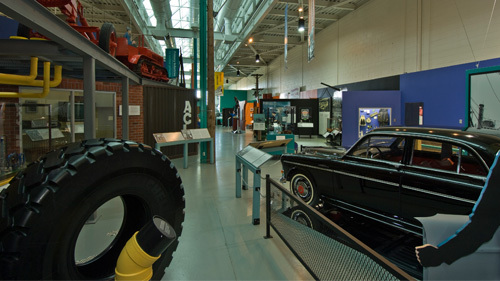 After parking your vehicle in one of our free and convenient parking lots, you can easily spend hours here exploring the biggest exhibit galleries in Nova Scotia. Follow the story of how Nova Scotia changed as a result of the coming of industry and industrial work. Artifacts big and small, photographs, recordings, video, and hands-on experiences engage you in the story of work and workers. It’s not all serious learning; you can get your hands wet feeling the power of water, or prove how fast you can move filling chocolate boxes with remarkably lifelike treats as they progress along the assembly line. Better yet, have fun deciding how fast or slow the conveyor belt moves. Can your group keep up? During the summer you can watch demonstrations of belt-driven machinery or a model saw mill, try your hand at the techniques used by pioneering women to create useful articles for the home, quiz our knowledgeable interpreters or participate in a fun activity. Check Upcoming Events for more information on programs and activities. We pride ourselves in seeking out unique giftware, toys, jewellery, and especially made-in-Nova Scotia items, making a visit to our gift shop a very satisfying shopping experience. We have been sure to include small, unbreakable gifts and souvenirs for travellers, and a chance to stock up on batteries and postcards. Sorry, there is no food service. If you pack your own lunch, there are picnic tables on site. Some snacks are available in our gift shop. If you need some fresh air, we offer spacious grounds with shade trees and picnic tables. Interpretive panels add to your enjoyment by explaining the history that makes us a national historic site. And there is even an opportunity to try your hand at quoits, an old game similar to horseshoes formerly played by coal miners and others. Stand in the shadow of the partial reconstruction of the Cornish pumphouse, a remnant of what was once the deepest coal mine in the world. From here you also can access an 8-kilometre walking trail that follows the East River to the north end of New Glasgow. To learn more about the local area, make sure you see Coal And Grit, an exhibit dedicated to the rich and sometimes tragic history of coal mining in this region. Near our front entrance we also have brochures, maps and information related to Pictou County and the surrounding area as well as Nova Scotia’s family of museums, the Nova Scotia Museum. Tired of tiny text? Want to see an image a little more up close and personal? Now you can easily zoom in and out of Web pages.